Zeal Solutions Custom Web Services - Portfolio / Anderson Manufacturing Company, Inc. Pool owners by providing information and connecting them to pool service providers in their area. with an online store of pool leak detection equipment. 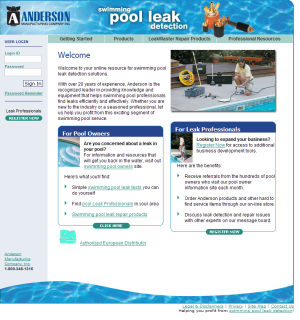 Both sections contain relevant information to help find and repair pool leaks. In addition, great care was taken in designing the site for search engine result optimization. We met at the client's place of business and communicated through email and telephone. Some of the website work was completed at the client's place of business to help better understand requirements.